About 55 years ago, one couple opened a café at a street corner in Kochi. 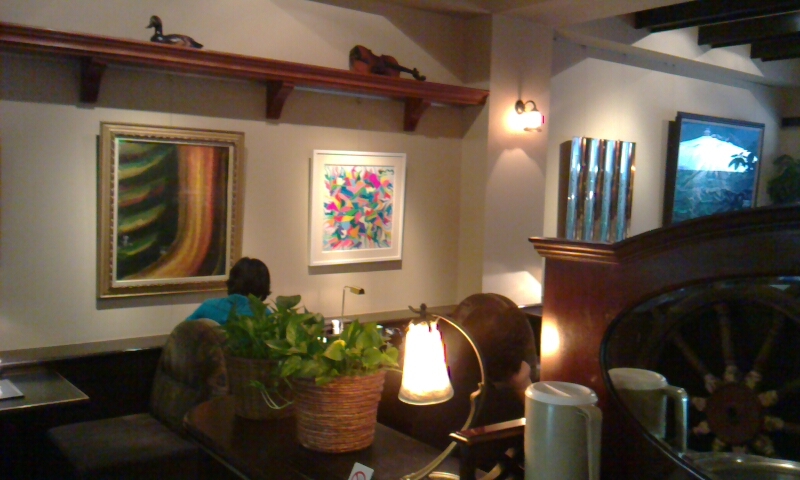 The café, named “Chopin”, was really small one. One day, the husband felt his café to be too simple, so he tried to paint its windows like stained glass by watercolors for children. This led him to try to make it more and more wonderful. Some time after that, the wife put “a morning set” on the menu. This is a breakfast set for small cost like a price of a cup of coffee in the morning, and which quickly became a long standing hit in Kochi. 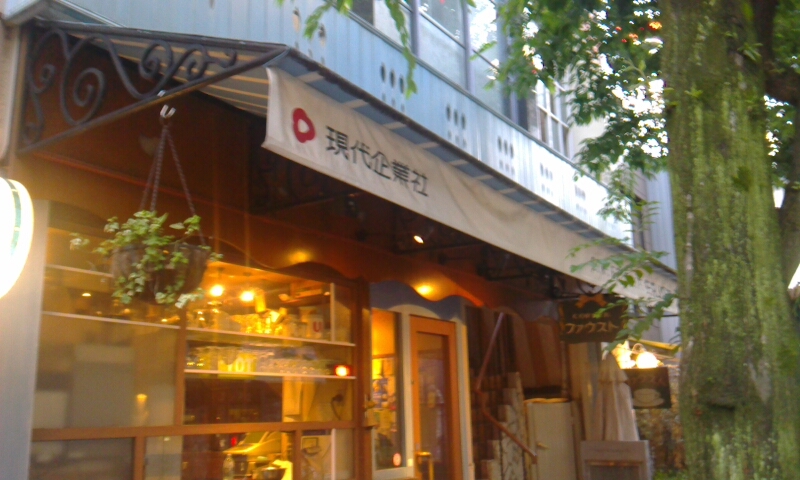 This small café is the beginning of “GENDAI KIGYOSYA” which is the group company running various restaurants or cafes at many places in Kochi. For example, the first café, “Chopin” has changed its name to “FAUST” and it now looks fashionably suited to the stone-paved road on outside. When you enter the café, you can see the first floor whose half is going underground and the second floor is like a loft. On the first floor, there are small tables and chairs and on the wall, it is decorated with antique articles. It is like a dollhouse. The second floor, in contrast, has some seats and most of it is sofa table. It is like a good old café. Each floor can make us forget about the noisy outside life, so they are like a hideout. As you go further upstairs, the space before a little dark becomes more and more bright and you can see the third floor decorated with lots of toys. It is like a child’s room. On this floor, there is also a gallery and that is Gendai Kigyosya’s original character which others may not have. “For a success, we have to seek another appeal point so that it is important to cultivate our invention or aesthetic feeling.” said, Mr. Onishi, the president of this company and a son of its founder. There is a picture at the coffee shop “Mephistopheles”, one of cafes of Gendai Kigyosya. The picture with drawing many colors on its canvas was painted by his son. This advice led him to publish “the Gendai Times” which is an information magazine of the company. In the times, it is written not only about various information or introduce of each Gendai Kigyosya store, but also about information of events like Sunday Market in Kochi. “In the past, my father used to check what I wrote. Now, I become to check what my son writes” said the president. As one of ideas, he is thinking that they make an existing restaurant larger and add something like a direct sale store so that there becomes a kind of amusement spot. Anyway, we can except their way to fuse their good points and the needs of Youngers from now on. The reason why the president dwells on young people is not just business. Gendai Kigyosya also aims to make Kochi better by making their stores better. For that, the president works actively not only to make his new store but also to make a city in Kochi. He once proposed to make a theater in Obiyamachi, but that was impossible because of a land problem. So, he finally decided to make it at the second floor of the coffee shop “Mephistopheles”. “Even if you propose something, sometimes you cannot realize it. However, you should not give up there but propose other things again. By doing so, you can show your sincerity.” The president spoke strongly with his idea notebook in his hands. This company’s shop’s atmosphere is something different from other fast food stores. I hope more and more shops like this opened in Kochi! I also love Gendai-cafe and there’s food. There is one of my favorite places in Kochi. My foreign friends love it, too. She said to me “Here’s like a doll house.” in FAUST. I think so too. I really thank their creativity. I strongly want to live there!